Here at Hostaria distinct aromas bring back sweet memories of Sunday gatherings when tables were set by our grand-mothers. These women were proud and happy to welcome their children and grand-children to share not only memorable meals, but more importantly to celebrate life and the pleasures of being together! The kitchen is our workshop… our source of creativity, where our staff /chefs gather(s) regularly to share their ideas, their gastronomical experiences and their well-kept family recipes. Meanwhile, our dining room is a melting pot of past and present culinary experiences. Here warm Italian hospitality is inherent… this is our formula, this is who we are… this is Hostaria! Please take note of the 8$ charge for the valet service. SVP prévoir 8$ pour les frais de notre service de valet. Our dinner was AMAZING! We began with an amuze buche of arancini, which was followed by a charcuterie platter; both were great! 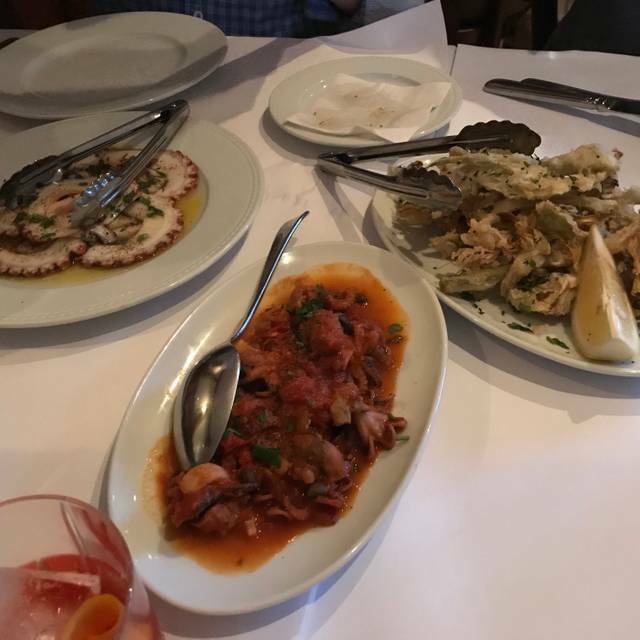 As an appetizer, I had the beef carpaccio with wild mushrooms, while my friend had the grilled octopus - carpaccio-style. They were spot-on! For the primi, I had the freshly made papardelle with boar ragu and my friend had the seafood risotto: flawless! As for the secondi, we both had the rabbit; simple yet masterful! However, with the arrival of dessert (a limoncello tiramisu), a bittersweet taste remained, as this was Hostaria's last week in operation. This restaurant has yet to fail me. It takes skill to elevate rustic Italian cuisine, since the cuisine is focused on the ingredients and their execution. Unlike other styles, there are no sauces to hide behind. Hostaria was a gem and accomplished this feat beautifully. You will be missed ... a presto! Nice meal. Glad I got to eat here before they closed for good! Article dans menu non disponible, nous voulions avoir du bisons mais il n’était pas disponible. Wanted to have a leisurely lunch with a friend and enjoy great Italian food. Unfortunately, I remembered the quality and attention to detail of Il Mulino and was disappointed. My antipasto was a mixture of grilled, marinated and cooked vegetables with little thought to presentation or balance of flavors. The whole grilled fish was excellent but served with a watery salad. The crostata desserts were stone cold. We were two and spent over 100. $ for lunch, no wine, just bottled water. Terrible espresso. Perhaps it was a bad day. The service was very good and the space is nice. This restaurant is amazing. Hurry-up before they close! The owner is retiring and closing the restaurant. Such a shame, one of the best italien in Montreal! Wonderful food. Everything was delicious and authentic. Loved it ! Nous avons beaucoup apprecie notre repas du midi. Les mets etaient succulents: les portions sont genereuses comme le furent l'antipasto et le plat de pates - tout a fait delectables. Le service est tres attentionne. La carte des vins est egalement variee et abordable. Je recommande fortement ce restaurant. Really enjoyed this dinner with friends. Food was Excellent... take the special of the day it is great value and opportunity to eat seasonal products. Nous en étions à notre deuxième visite. Nous étions en bonne compagnie avec des amis. Bel accueil. Menu intéressant. Sommelier/serveur qui maitrise très bien le menu et qui nous a proposé de bons choix de vin. L'ambiance est chaleureuse et on peut sentir une belle complicité entre les membres du staff. Nous avons vraiment beaucoup aimé notre soirée et clairement nous y retournerons. Excellent restaurant, service très courtois, nourriture savoureuse. Nous avons beaucoup apprécié, particulièrement Simon! Rabbit was so so. They should have put more pasta in the plate. Did they change owners? Chef? Felt different. Following up on a positive newspaper recommendation and glad I decided to make reservations (an absolute must). Not inexpensive but good quality deserves its price. Group of four each had something different as our main dish, that varied between pasta to fish to pork, and everyone raved of their respective choice. A special shout out to my farro salad as my starter; very tasty! The service was spot on, not overwhelming, not intrusive; proper recommendations without going overboard with hyperbole. Always one to try something once and then head out to something else, regardless of how good the experience. But this is one place I definitely plan to return to. Always a fantastic experience. Love this restaurant. Service impeccable. Le repas plus que délicieux, un régal pour tous les trois. Une excellente adresse où retourner. Il faut réserver sinon on serait déçus de ne pas avoir de place. Un secret bien gardé à montreal. C'est un endroit très agréable, les gens du service sont courtois, veulent nous satisfaire et réussissent à nous faire passer une belle soirée. La cuisine est excellente! Un VRAI resto avec des plats intelligemment préparés...pas de flafla mais de la qualité et de la gastronomie vraie! Service impec! Pâtes et viandes comme dans un village italien! Everything was perfect, until I tasted the ´carpaccio de pieuvre’ which was way too cold (center was almost frozen). Then came the seafood short pasta, which would have been very good if not for seashells cracked and broken which made it almost impossible to enjoy the dish. 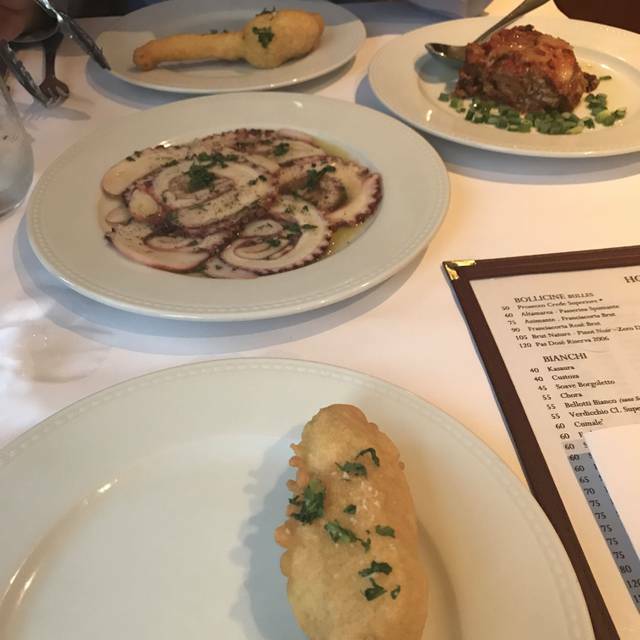 My partner had tomatoes and mozzarella which were excellent and the deep-fried veal chops ´scallopiny style’ were just as excellent. We went for my birthday/ Valentine’s Day. We love this restaurant and have brought our friends. The service felt somewhat inattentive and no mention was made of my birthday. We love the food there, but considering the significance of the day, it did not quite meet our expectations. Very nice family diner. Everyone enjoyed it very much the waiter was especially nice and helpfull for every questions we had. Never rushed we could enjoy every minutes of our meal. 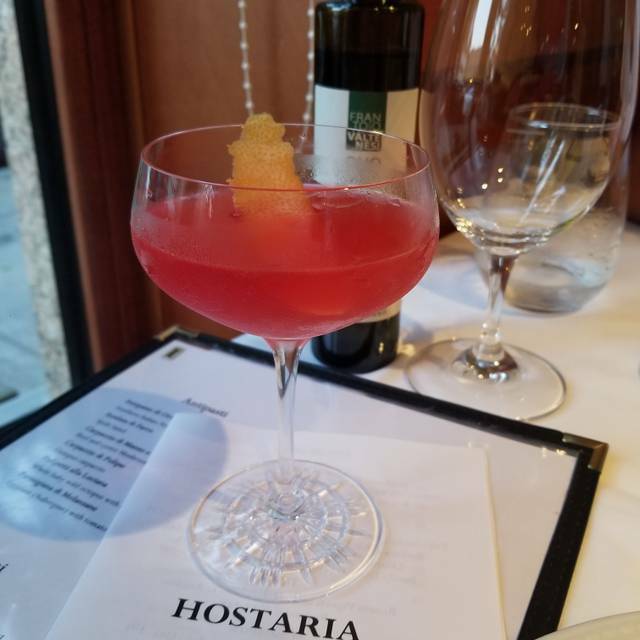 First time at the Hostaria but definitely not the last. Great place - love going there and will surely return! What a great restaurant! The food and services were excellent! Gnocchi to die for- I could eat them every day! Big portions and freshness A1! Super menu & sommelier guided wine pairings. Quiet, friendly, top-notch Italian meal. Hostaria is an upscale and elegant Italian restaurant. Highest-quality everything ~ From service to meticulously prepared cuisine. My spouse savored the Cornish hen and continues to talk about it! The burrata salad is as good as it gets! The tradition continues: this is our favourite Italian resto in Montreal bar none! Very attentive, cordial service with superb market-fresh food. Great for a quiet long lunch or for dinner. Bravo! Excellent food and service. The very best was the buffalo steak (for 2 persons). It was divine! I was very disappointed because the food was very average, and the service slow. No change in the menu, always the same selection. Fish is good. Not a good place if you like vegetable . Italian prosciutto slice thick. Cheese selection for dessert was not good at all. Use to like this place. Plats beaucoup trop salés / service ordinaire (3 différents serveurs qui ne se parlent pas et qui passent leur temps à venir t'interrompre) / musique de type Barry White / dispendieux. Extrêment savoureux et toujours délicieux...Artichauts frits, gratin d'aubergines, taglioli maison avec champignons sauvages, cochon de lait lentement rôti au four avec plein d'ail et herbes furent notre choix cette fois-ci. Mon conjoint n'arrêtait pas de grogner ...de satisfaction! Et de se plaindre que nous n'y allons pas assez souvent. Simon, le nouveau et sympathique maître d'hôte qui a remplacé Andrea, nous a fait de bonnes recommandations pour le vin. Et notre serveur, Patrizio, tout frais débarqué d'Italie, a eu la générosité de nous donner plein de bonnes adresses pour notre prochain voyage dans les Pouilles, en Italie. As usual, our dining experience at Hostaria did not disappoint. Christian's suggestions as to the mains and wine parings were on point and the tiramisù alla limoncello was a great ending to a great evening. Ce fut un vrai plaisir d'aller manger chez Hostaria. La vraie nourriture italienne goûteuse et authentique. 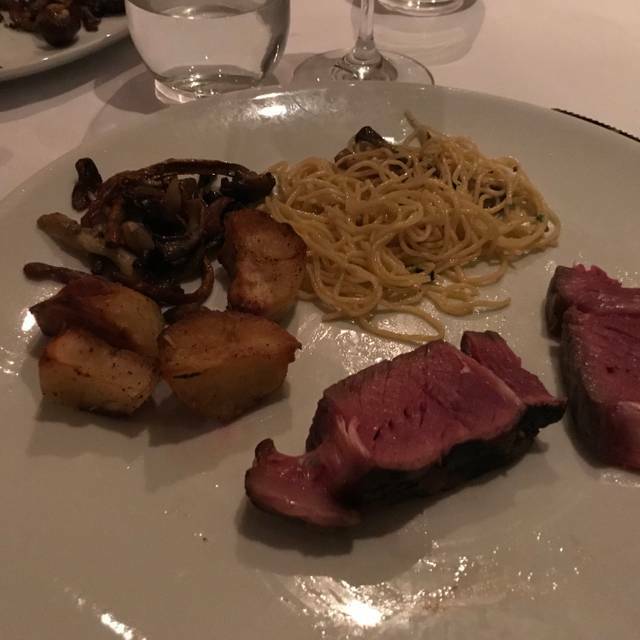 Pas de dessins avec du vinaigre balsamique dans l'assiette et pas d'histoire de "sashimi" italien comme un serveur nous a déjà dit dans un autre restaurant de Montréal. Ici tout est authentique italien. Un pur délice. Best chicken I've ever had in my life. Simply amazing. You owe it to yourself to try this perfect Italian restaurant. Everything is prepared impeccably and the owner Massimo's hospitality is unsurpassed! Try lunch open Thursday or Friday, just as good and very reasonable. Le bruit était trop important. Il faudrait trouver une solution, si non??? The quality of the carpaccio didn't justify the price. They brought a pasta with meat when I ordered a seafood pasta. This is a romantic restaurant with dimmed lights, attentive service, and very good dishes. The specials sounded very appetising, but they ran out of a few dishes towards the end of the night. The food was not super creative, but had rustic charm with great execution. I would definitely recommend this restaurant for upscale Italian cuisine in Little Italy. Great Italian food! Very authentic! Would recommend!